Alexia Tarabotti, Lady Maccon, has settled into domestic bliss. Of course, being Alexia, such bliss involves integrating werewolves into London High society, living in a vampire’s second best closet, and coping with a precocious toddler who is prone to turning supernatural willy-nilly. Even Ivy Tunstell’s acting troupe’s latest play, disastrous to say the least, cannot put a damper on Alexia’s enjoyment of her new London lifestyle. This has to probably be one of my favorite series that I had read/listened to in the recent past. I loved all 5 books and while various ones had their ups and downs, like can be expected in a series, overall, they were well worth my time. I can’t wait to see how the spin-off series featuring Alexia’s daughter is going to turn out, as well as the other series pending that is set in the same world, but 20-ish years prior. But I digress. 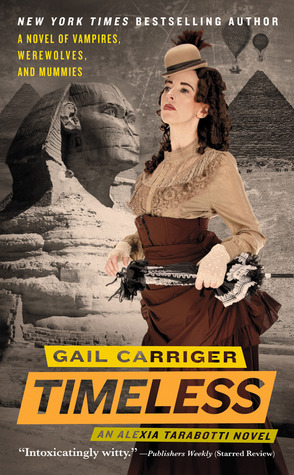 Timeless picks up 2+ years after the end of Heartless – but not much has changed in the world. There are still vampires and werewolves roaming loose in London, but Alexia isn’t just having to cope with that, she also now has a toddler to chase after. Adding a twist to this installment, Alexia travels abroad to Egypt (and all that entails). I really want to say more, but it could easily turn spoilish and I don’t want to ruin this series for anyone. As I was listening to Emily Gray’s narration, I realized that sometimes, it felt like the author had just reached into a hat filled with various sounds and pulled several out to make names of some of the characters. I also loved Lord Ackeldama – he has been one of my favorite characters through-out the whole series and I can’t wait to see the influence that he has had on characters in the later books. I have to admit to being a bit disappointed by the Biffy/Professor Lyall scenario – I don’t think that it really added anything to the book overall – but maybe it will be needed in the future.